We are Allison and Jeff and have over 20 years experience of dogs. We started our dog care business is 2015 and it has gone from strength to strength since then. We have 2 of our own dogs, Olly and Mac ( a Springer spaniel and a Cocker spaniel) and 2 boys ages 13 and 11. We will look after your dog as if it's our own and they will enjoy a holiday with our family and have the run of our family home. We are confident in dealing with multiple dogs on a daily basis and will happily walk them on a 121 basis should you prefer. We will try and keep as close as possible to your dogs usual routine so as not to add any stress to them being away from you. We are both Canine First Aid Trained. Jeff holds a certificate in basic canine behaviour and Allison holds a level 4 diploma in Advanced Canine Behaviour. We have been awarded 5/5 stars for meeting the new animal welfare conditions on our license at our 2019 inspection. We ask that all dogs are neutered/spayed and fully vaccinated including kennel cough. Vaccinations need to be completed at least 4 weeks prior to boarding. We also can accept a valid titre test, however Lepto vaccine is still required as this is not covered by titre. Walking... £8 for 30 minutes, £11 for one hour. (picked up and dropped off from owners home within 5 miles of NE32.. Additional miles are charged at 50p per mile. 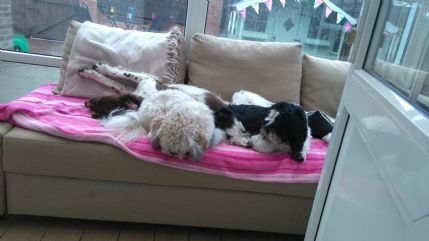 Homeboarding... £30 per 24 hour period (1 dog). £45 For 2 dogs from same household. To secure dates a non returnable 40% deposit is required. I can collect and return your dog from your home if you wish. This service is included in the boarding costs within a 5 mile radius from NE32. It is 50p per mile outside of that. I can also visit puppies in your home while you're at work to let them have a toilet break and some company/playtime if they are too small to go for a walk until fully vaccinated. We now offer a wedding package where we can collect your dog on the morning of your wedding, take to a groomer of your choice if required, bring them to ceremony or for photos afterwards, return them to a friend or relative or we can look after them for you in our own home overnight. My cavapoo Harry stayed with Allison and Jeff for 1 night. He has never been left with anyone one before and I think I was more anxious than he was. I received a text from them saying he had settled well and that totally put my mind at ease. They cared for Harry like one of their own, took him to the Beach which he loves and brought him back, tail wagging. I can only presume he had a good time. I would have no problem leaving Harry again. Thank you Allison and Jeff. Jesse is an older rescue dog who had been home for 9 months when I contacted Allison. He was unpredictable, especially around strangers, and I was worried about how he would take to an entire new family looking after him. I needn't have... allison and Jeff took the time to get to know Jesse first and week by week he grew to trust not only them, but as a result, just become generally more relaxed around other dogs and people. Jesse was treated like a king while we were on holiday and I was kept updated with daily photos by Allison. But aside from how well looked after he was while boarding, allison and her family have to take the credit for Jesse being a changed dog!! Jesse now sees his pals once a week and the biggest reflection of the quality of allisons service is how fast he bolts out the door to her car when she arrives!!! Couldn't recommend highly enough. Thanks so much Allison, Jeff and boys!!! Our Labrador Benji has spent 4 days with Allison and her family, she's been in touch via text to let us know how he is getting on daily. he's been well looked after and benefited from lots of exercises and attention. Excellent reliable service. Highly recommended as an alternative to a formal kennel environment. Will use again. We left our dog sully with Alison and Jeff and he's been so well looked after. He's come home with bright shining eyes and so calm, they are so professional and caring, without a doubt would leave him in their care again! My Dog Milo stayed with Allison and Jeff and he absolutely loved it. They cared for Milo like one of their own, took him to the Beach and Walks. I would have no problem leaving Milo with AJ Dog Care again. Also Allison kept me informed how Milo was settling in, which took away any concerns I may have had. I would highly recommend this lovely Home Boarding facility. My French Bulldog has just stayed the week with Allison whilst we were on holiday and we were very happy with the care he received. I would not hesitate to use AJ Dog Care again. Our border collie Toby stayed with Alison and her family and he was really well looked after. He came back happy and well adjusted which is testament to the great care he received. Thanks so much we would definitely recommend your service. Excellent boarding service in a lovely family home, our 15 week old puppy had a fabulous time where he was spoilt rotten, he even had a party bag to bring home with him. We will definitely be using Alison and Jeff again, in fact he's already got a few more overnight stays booked and can't wait to go back, nothing is too much trouble. Thanks again Lisa & Paul. Based on Fellgate Estate .